Swimming does not come naturally to me. To be honest, I dread going to the pool to swim laps- the monotony of swimming from edge to edge kills me. But the physical benefits and the post-swim sensation have me hooked. 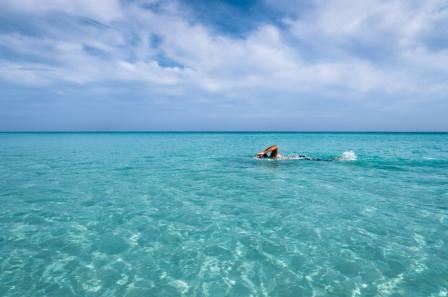 Yesterday, I finally mustered up the courage to do some 'laps' in the Caribbean water. It is not like there are any dangerous rip-tides or large waves in the water surrounding Ambergris Caye, but I have always been a bit weary of swimming in any body of water other than a pool. I pushed off from the ladder into the Caribbean. Right away I felt my pre-swim banana tumble around in my stomach. The 'waves' were rocking me back and forth, spitting ocean water into my face when I took a breath. This was definitely not the motionless chlorine water I was accustom to. I turned over onto my back to synchronize to the current. Within a few minutes, I settled in the Caribbean water and made my way to the opposing dock. The first few 'laps' all I thought about was not breathing on the side with the incoming 'waves' and how I missed the dullness of the pool. Then, mid swim, I spotted a camouflaged sting ray, asleep in its sea grass abode. A few minutes later, a watermelon-pink starfish the size of my face flaunted its natural beauty. At that moment my mindset shifted from wanting the waveless pool to excitement for what my next stroke would bring. Still in awe and disbelief of the ocean critters I just swam over, it took me a while to realize that the silver, pen-cap sized thing that had been by my face for the last 'lap' was actually a fish. I mean it looked like it was swimming but I am used to fish swimming away from me. Maybe it was my bright orange goggles that attracted him to me. Regardless, it was nice to have a swimming buddy by my side. As I climbed up the ladder back to the dock, I found myself mid rung gazing out to the vast blue abyss that was home to unbelievable creatures. All it took to witness such animals was swimming off the beaches of Ambergris Caye. Throwing my shorts on over my salty bathing suiting, I biked back to Grand Baymen inspired by the Ambergris Caye motto: "no shirt, no shoes, no problem." Discover all of the amazing things to do in Belize. With a passion for new cultures and landscapes, Melanie is an avid traveller who enjoys tasting native fruits and vegetables. Despite not knowing Spanish, she fell in love with Central America during a trip to Nicaragua in 2012- when she had her first bite of a handpicked mango. She is currently exploring San Pedro, Ambergris Caye for the summer.